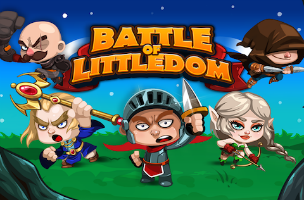 Mobile games company DeNA has announced the worldwide launch of Battle of Littledom on Android devices. The adventure role-playing game sees players collecting a group of warriors, from knights and wizards to elves and assassins, before taking them into battle on a quest to reclaim the throne of the kingdom. In Battle of Littledom, players start with just a few units, with each having an elemental affinity. These relate to one another in a cycle similar to “rock, paper, scissors.” Water is strong against fire but weak against electricity, for instance, while earth is stronger against electricity, but weak against fire, and so on. Battles are level-based and turn-based, and see players tapping on a character’s portrait at the bottom of the screen to unleash an attack. When players do damage to enemies, they collect blue gems, which charge a character’s special attack. When the attack is ready, players tap and hold on the portrait and swipe upward to unleash this attack, which may cause massive damage to the enemy team. Players earn new recruits as they complete battles, and can also recruit new troops instantly by spending free or premium currency on unit card packs. As players collect excess or “lesser” units, these can be fused into an existing unit to make it stronger. Each unit can level up individually, which increases their stats (including attack power, defense, health points and more). Battle of Littledom is available to download for free on Google Play. The game is coming soon to the iTunes App Store for iOS devices.